Another great-looking batch of Topps cards here almost had us adding "high grade" to the title, as the vast majority have NM+ and NM-MT (or better) appearances. On closer inspection, we spot (16) cards that had a coin rubbed, albeit lightly in most cases, across the area on the back that reveals the comic answer to a trivia question. 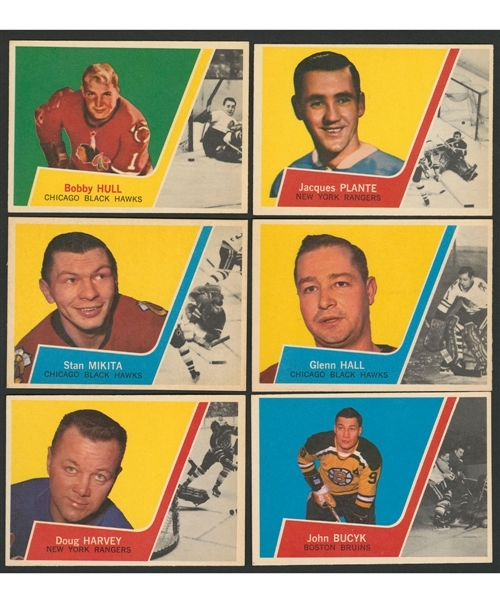 Unfortunately, the key Bobby Hull card (otherwise NM+) is one of them, with other notables being 1-Watson, 2-Johnston RC, 23-Hall and 57-Gilbert. Among the highlights without the flaw and at NM-MT are 11-Bucyk, 43- Black Hawks Team and 45-Plante, with 47-Harvey and 63-Ratelle at NM+. 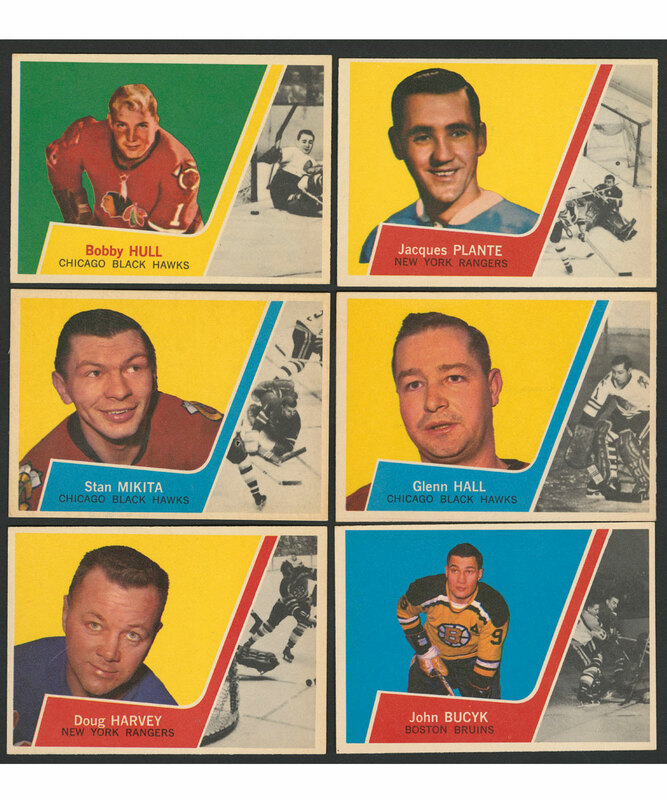 Close at NM are 21-Bruins Team, 36-Mikita, 46-Villemure RC and 65-Rangers Team, with a slight diamond cut observed with the three team cards. The unmarked checklist exhibits slight warping and is EX+. Three cards include indentation "dots"; 4-Johnson, 5-Boivin and 8-Westfall RC, rendering them condition exceptions, the same as a creased 28-MacNeil card. Much to ponder and consider with this colorful Topps group.